If you love using drones, then you know there’s nothing more irritating than steering slightly in the wrong direction, and watching your drone fly right into a wall and shatter into pieces. For all the money you put into them, shouldn’t they withstand more than that? Finally the perpetual fear of your drone being destroyed on day 1 through careless steering is a thing of the past. We are proud to introduce The Droneball, created by iMaze Toys, the people behind Angry Birds and Air Terminators, is the world’s first collision-tolerant drone, and its unique design allows it to simply bounce back from collisions that destroy others. Created to go the distance, the design of the Drone Ball begins with an exceptionally powerful quadcopter craft with a 6-axis gyroscope, adding a greater level of control compared to most drones on the market. But the big innovation is the cage the surrounds it. This cage, along with its multi-axis running ring track, allows the Droneball to simply bounce off walls and obstacles that wreck other drones. 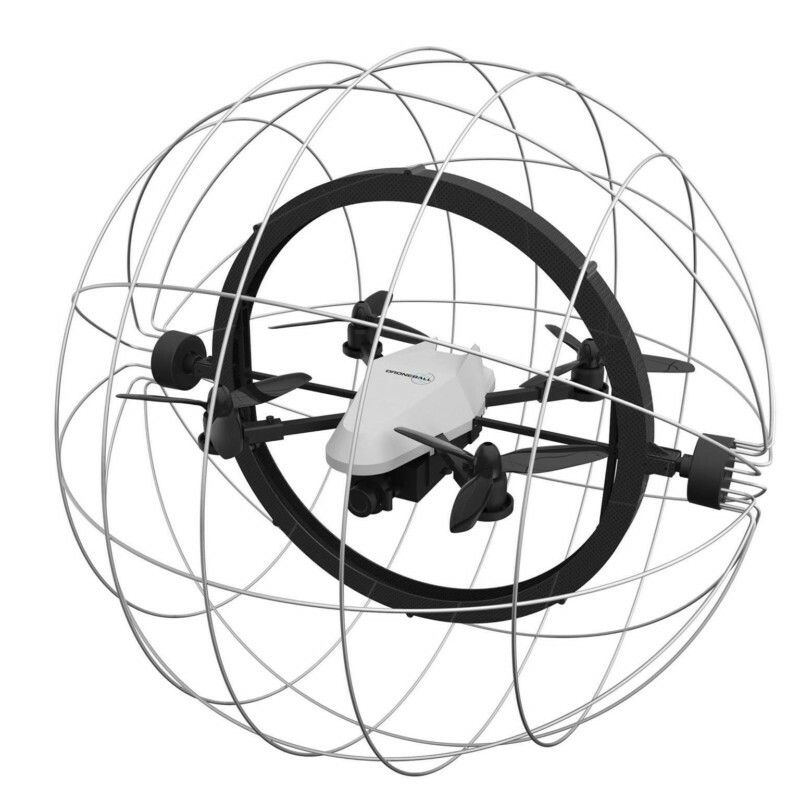 With multi-axis maneuverability, the Droneball remains level inside the cage after a collision, removing the need to regain control and keeping you in the air for as long as you want. No matter where you are or what obstacles you’re navigating through, you don’t need to worry about the copter’s safety with Droneball. Droneball brings you 5.8GHZ Transmission technology ultra strong signals are achieved with anti interference capabilities and long distance video image transfer. Droneball’s camera is not only capable of recording stunning 1080p HD video, it can also take high resolution photographs. This allows user to instantly share footage on their smartphones or tablets, from high quality photography to aerial footage. Even when beyond visual range, you can still capture the scene! ALL-IN-ONE FPV SOLUTION Compatible with most FPV glasses Droneball’s wide field of view camera is specifically designed for FPV flight. The Droneball launched on January 3th on Indiegogo with a goal of $ 75,000 to fund the first wave of production. In addition, iMaze Toys has partnered with Walkera Technology to bring this to market, and they have decades of experience developing and manufacturing quadcopters, FPV camera drones, racing drones and other UAVs for the consumer market, commercial users and governmental agencies. Early backers of the project receive the Droneball for only $399, nearly half the price of the final retail version, alongside goodies like a rucksack for carrying and a red light pack. Dieser Eintrag wurde veröffentlicht in Crowdfunding, English, General, UAV und verschlagwortet mit collision, crowdfunding, Drone, Droneball, IndieGoGo von Sebastian Trella. Permanenter Link zum Eintrag.